ISLAMABAD: Brilliant colours conveying daring thoughts were put on display in an exhibition of exquisite miniature paintings at Nomad Art gallery in Islamabad on Wednesday. 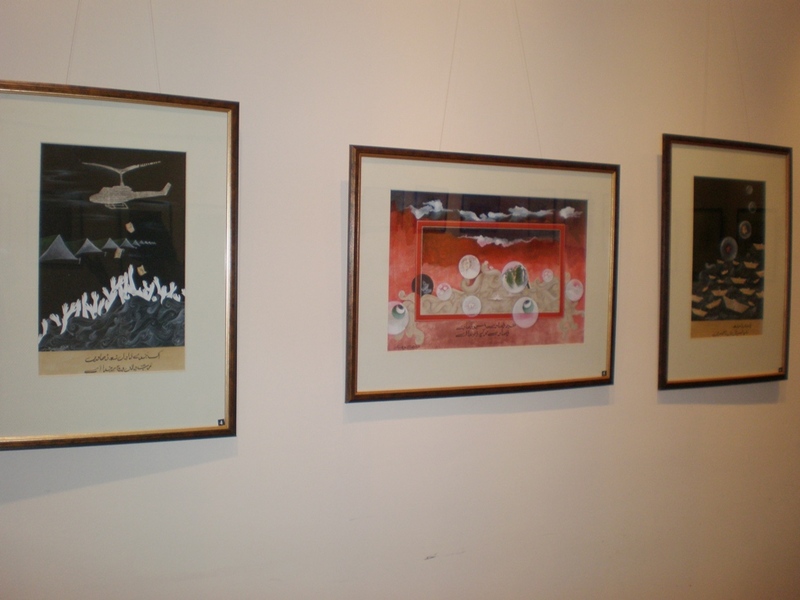 The solo exhibition titled ‘Waqt ke Sath Sath’ gave the impression that how with the passage of time the element of fear and frustration has seeped into the minds of people affecting their peace of mind. “I have painted all the frustration that has enveloped my mind due to the socio-political issues around me” said the artist, Ms. Farrah. Though the paintings speak of bold, daring issues however they were not meant to create a stressful impact on the mind of the viewers, but “to create an awareness of these burning issues in order to raise voice and combat against them”, said the artist while talking to Pakistan Observer. The solo show of 30 paintings by Farrah Adnan depicted the cultural, socio-political issues of the country in a variety of themes, each theme including 2-6 paintings. Some of the noteworthy themes were honour-killing, front line, overturning, innocence’s journey and basant. The theme of ‘Over turning’ combined with philosophical verses of Bulleh Shah was based on flood victim’s plight questioning the genuine role of authorities. The series concluded on Quaid-e-Azam’s key quote “Unity, faith & discipline” which could work as a guiding force for our nation, according to artist. ‘Front line’ I & II using the technique of gouache on marbled wasli, highlighted the agony caused by drone attacks while questioning our internal ability which has been maligned by the syndrome of corruption. While ‘Front line IV’ theme based on suicide bombing paid tribute to the security forces for their sacrifices for the nation. The paintings on the theme of ‘Affect’ signified the psychological affects, the internally shaken mindset of citizens due to man-made and natural disasters such as terrorist acts as well as floods in the country. The theme of ‘basant’ highlights the cultural aspects of our society. “In the theme of ‘Innocence’s journey’, I have used flower to represent children and lotus for females” the artist said. on honour killing in the country through art. Al-Raheem and Al-Rahman, with ink and silver leaf were two calligraphic patterns making them unique from the rest of the issue-based paintings. The artist depicted the sensitivity of strong subjects thorough a powerful medium that is in the form of art while using a customary medium. “I have used very traditional medium” said the artist. The medium used was gouache on wasli and gold and silver leaf on wasli. 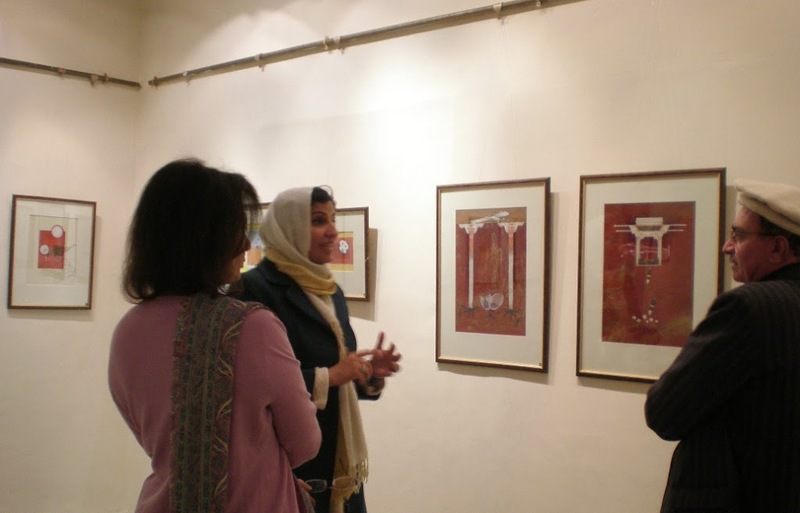 The accomplished artist as well as an Associate Professor of Architecture and Design has displayed her works in number of exhibitions at home and abroad and got many awards for her stunning techniques. The show continues till January 2.